What are you willing to do to show your love? “I love you.” Those words carry great significance. We hear them and feel a number of different emotions. How we react depends on who is speaking to us. Similarly, by saying the words aloud to someone else, we hope to impact their feelings. It seems like this simple, short expression should do nothing else but make moments in life more enjoyable. As parents, we effortlessly cuddle our infant children and whisper that we love them. We read books like Guess How Much I Love You to them and rock them to sleep with the words from Love You Forever. Some of us—older parents—now have adult children. We remember doing silly things, like singing along with . . . maybe even dancing to . . . Barney the Dinosaur as he nasally projected the lyrics to his “I Love You” song. Mature moms and dads, we look back at tender moments such as these and wonder how time passed by so quickly and stole our babies from us. We realize that saying “I love you” was easy when showering affection upon our little ones. But wasn’t it hard to get those words out for the first time when dating our would-be spouses? Hopefully, by the time we know we’re in love, the other person feels the same about us. But there’s anxiety in that moment in which we’re wondering whether or not our words of endearment will be returned. If they aren’t, we feel squashed and rejected once we’ve uttered, “I love you.” Old scars and deep wounds from past relationships oftentimes affect our new ones. For example, a divorced man, whom I’m going to refer to as The Captain, struggled with telling his second wife how deeply he felt about her. Throughout their marriage, he instead made sure that he showed love to her. Tennille, also an alias, understood the personal reasons that prevented The Captain from saying those three little significant words. That didn’t stop her, however, from wanting to hear, “I love you,” from her spouse. The couple found inspiration to their problem in the movie, Ghost. After watching the movie, The Captain and Tennille adopted similar dialogue for many years. Gradually, they replaced ditto with their own more personal, private, mushy word: smooches. This one word became synonymous with love because the couple reserved their flirty exchange only for each other. I first learned of it when The Captain spoke about it during his and Tennille’s twenty-fifth wedding anniversary party. As I celebrated with the couple that night, I agreed with The Captain’s point of view that showing love through our behavior and in our conversations is the best way to convey our love for someone else. On the other hand, I believe that husbands and wives should also be comfortable saying “I love you” to one another. As long as it doesn’t become a rote response, it’s a strong reminder of the bond between them. I have proof that there’s power in the words. Years ago, I was a less experienced driver than I am now. I turned my car, evidently too quickly, into an intersection with oncoming traffic. The oncoming car, which I had accidentally cut off, was full of people—rude people—who weren’t happy with me. They showed me just how they felt through both their crude actions—flipping me the bird—and through their words, which I’m glad I couldn’t quite make out. My anxiety level climbed sky high. Of course I knew I had made a mistake. At first, I was embarrassed, but then I was defiant. My actions had been accidental. These people were plain nasty. My blood began to boil and then for some strange reason I couldn’t bring myself to flip them off in return. Instead, I looked at the driver and mouthed, “I love you . . . I LOVE YOU!” Amazingly, my gesture diffused the situation. The other driver and her passengers responded with “I love you too.” We all ended up smiling at one another after that and I can tell you that I felt instantly relieved. Those words were and are powerful. Now, lest you think that The Captain and Tennille have anything less than a blissful marriage, let me finish telling their story. The Captain and Tennille had never had a song. You know what I mean: a special song that a couple claims as theirs. A song captured during a meaningful moment; secured safely in the hearts of two lovebirds; and often selected as the first song a bride and groom dance to as husband and wife during their wedding reception. In turn, Tennille surprised everyone, including The Captain, by reading the words of a different song, “Through the Years,” which reminded her of her relationship with The Captain. If you take a moment to listen to those songs, you’ll know that saying “I love you” isn’t essential for a good relationship. For me, that doesn’t mean I’ll stop telling my husband that I love him. The exchange is comfortable and meaningful to us. But we also recognize our love for one another in our own unique ways. Whether we exchange short texts or lengthier love notes, whether we go out for a date or stay home, whether I do something nice for him or he does something nice for me, the way we approach our daily activities reflects our love for and commitment to one another. We’ve learned that what’s most important in a healthy, vibrant marriage is to always love and respect one another, and, through the years, to show it with more than words. The world could use more expressions of love these days. Your story can inspire many to do so. Hard to believe with so many love songs recorded. I’ve been humming Captain and Tennille songs all month. And yes, Muskrat Love lives on YouTube four decades later. Thanks for sharing, Kelly. Oh my gosh! Has it really been that long? No wonder my daughter didn’t know who The Captain and Tennille were. I have three words for you Kelly….I LOVE YOU! I’m guessing this is my mother? XOXOXO to you. Kelly, I have to say, that every one of your blog posts moves in some way. Thank you for sharing yourself with us. Thanks, Wendi. I’m always hoping that my crazy thoughts make some sense. To be told that I’m able to instill some emotions in readers is a huge compliment. Also, Kelly, please tell me that’s not a real alligator the children are “playing” with. A bit shocking at first, isn’t it? 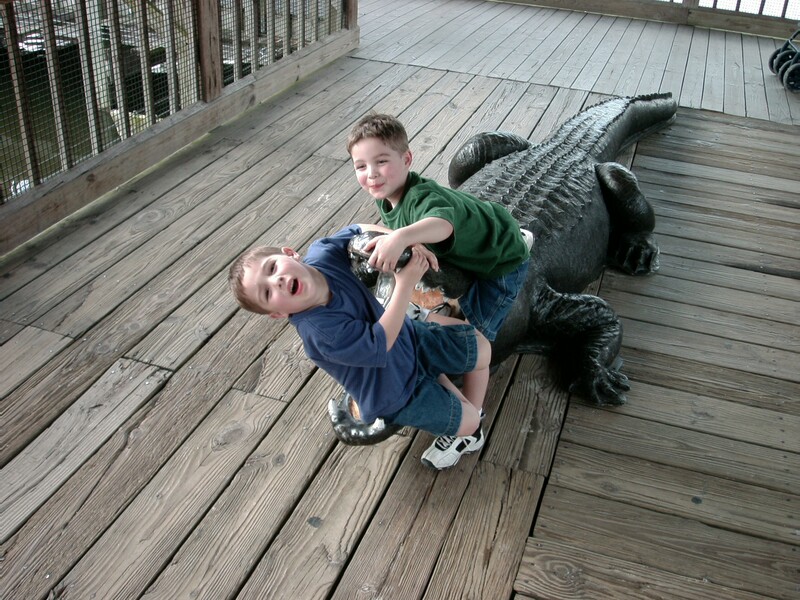 But those little cuties survived their Gatorland photo shoot and the fake alligator. The boys are now handsome young men, going off to college in the fall, and I will need those tissues you mentioned. Yes, the picture is shocking, but cute now that I know it’s fake . I remember when my daughter left for college. Definitely tissue time. Kelly, please pass the tissues. You have a great take on love. My husband tells me he loves me all the time with actions and with words. What a blessing. You and I are very fortunate ladies, Barbara! Earlier today, I discovered happywivesclub.com. I think I may have to join. Take a peek at the site when you can. I think you’ll like it too. Yes, Kelly, we are. I’ll have to check out happywivesclub.com. Thanks.